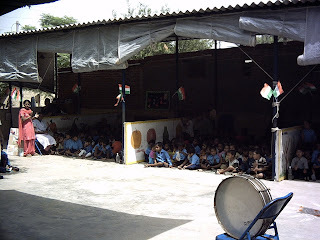 HOPE worldwide started a school in May 2004 in the Tigri area of South Delhi. A survey revealed that there were around 5000 children in this colony who could not go to school due to various problems. For most of the children in this area, the HOPE school is the only place where they will receive a decent education. For over 20 years ago, the Tigri area of South Delhi was a rubbish dump for the surrounding villages. Slowly people started to stay and a slum developed. It began to grow rapidly as immigrants from neighboring states would flock to the Capital in the hope of finding better job opportunities. As a result, the population of the slum grew and as there were very few opportunities, it became a breeding ground for anti-social activities. Under dire circumstances the school was started. Now thanks to many friends who have supported, the school has 4 proper classrooms, with electricity. The school consists of over 260 students. The students enjoy good education and also a hearty hot meal during the day, thanks again to friend's support. Now the children who would otherwise have been involved in dubious activities have become students who dream big and learn to achieve that dream. All students in their classes.